I decided to dedicate one page to things I do for fun. Or to be precise: Things I do for fun, which are not technology-related. Choir singing. My "home choir" is Shahar Choir. The material is mainly Baroque and earlier music (composers like Bach and those who wrote before him), and contemporary music (Britten, Poulenc and friends). Want to hear an example? 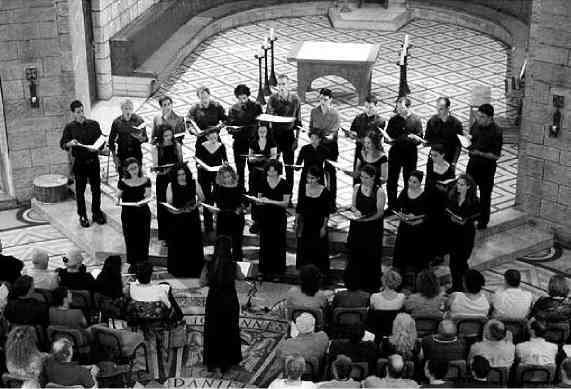 Here it is: Shahar Choir's performance at the Dormition Church (Jerusalem) of Christ Lag in Todesbanden, (5.4MB mp3) from Cantata 4 by J.S. Bach. This is a recording I did during a live concert on Oct 25th 2003. The cantata was performed with authentic Baroque instruments, which may sound weird to those who are not used to their sound. Persistent rumors claim that I've sung Mozart's requiem a couple of times, and I can't deny that. Neither sinning with some Barbershop in the past.